There just isn’t much to cheer about as a Reds fan right now. The Reds are playing out a string here in late June and in a season that they welcome the All Star Game, the team just seems so ‘blah’. They dropped two games today, one the completion of a suspended game in 13 innings and the other becoming the first belt notch in Steven Matz’s career in Queens. 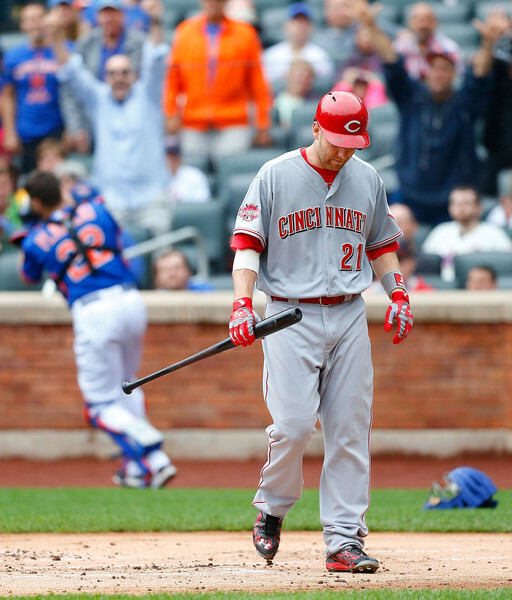 But there is Todd Frazier; the beacon of light. The Toddfather just hit his 25th homer of the year in the team’s 74th game. George Foster holds the record with 52 home runs which he hit in his MVP season of 1977. Right now, Frazier is in the hunt for this team record and 40 home runs seems a lock. I have to admit, I always thought Frazier would have a few Aaron Boone type years where he showed flashes of first-round brilliance at the big league level. But I always saw Frazier as more of a secondary start to the Bruce’s and Votto’s of the world. Frazier at this point is completely leveling any expectation I had of him. Little league swing or not, the guy has a .978 OPS and is going to catch Giancarlo for the National League home run lead shortly. He’s a good dude who goes about his game quietly, and he’s developed into a hell of a power hitter. That doesn’t go without salute in these parts. Plus, our wife loves him!